We were uncertain as to how the wines for this evening's line-up would fare, having had high hopes for the more modestly priced wines from the 2000 vintage last week. Those wines were, as a group, most disappointing. The sentiment seemed to be that last week's $50 were disasters, while this evening's $100 wines offered, at least, something well worth drinking. We see many customers expressing interest in 2001's, not wanting to have anything to do with 2000 Cabernets. You can certainly debate the value of the wines and their price tags, but I can say merely having the number "2001" on a label is NOT a guarantee of quality. And this tasting demonstrated that it was possible to make some really showy wines in 2000. One wine was significantly ahead of the group. Seven of the eight wines had first place votes, while only our top wine had zero last place votes! 8th Place: FROG'S LEAP 2000 Napa Valley "RUTHERFORD"
One taster described this as having notes of "dried raspberry, dill, horse leather and a nuance of cedar with herbs and mouth-drying tannins." Another felt this wine had "funky Brettanomyces notes but it's beautiful, showing smoky black cherry fruit and is a delightful wine for those of us who appreciate Pinot Noirs." Someone else felt this was "Initially earthy and musty with a mushroomy finish, but it does have nice black fruit. Later it seems to clear up and shows smoky, tobacco-like notes." 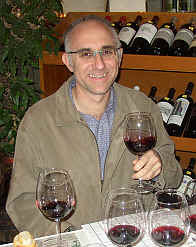 A fourth person characterized it as "Bordeaux-like" and found "Brettanomyces and charry notes." A final taster said it's got a "skunky nose, with earthy notes and some mushroomy, bitter qualities." I described this as showy very herbal aromas, with green, stalky notes and a touch of a leathery note. There's a nice touch of wood, but it strikes me as being a bit hollow and coarse on the palate. One critic felt this was merely "harsh and bitter." Another panel member said it had "no nose." Someone else found it to be aromatic, but not positively, saying "It's got a big, sulphur, sort of burnt rubber tire nose and a kumquat-like flavor and bitter tannins." Another taster felt it had "nice fruit," while someone else found it to be of "concentrated style, with earthy fruit, minerals, plums, tobacco, tea leaves and black figs." 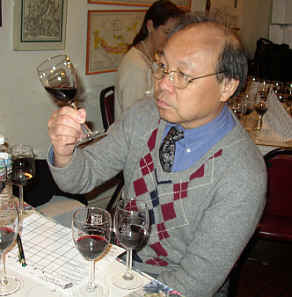 A sixth critic detected "dusty notes and it's a bit muted on the nose, with dense, oaky notes, un-evolved and tannic." A final critic complained it "has too much oak and tannin with a band-aid-like note." I rather liked the mildly woodsy fragrances on the nose and it's mildly berryish character. It's slightly earthy on the nose, too. On the palate I found nice fruit and some cherry, berry fruit and nice wood. I gave it a one-and-a-half star rating on my 3 star scale, no stars being a standard or ordinary quality wine. This has a fair bit of tannin, by the way, so 5-10 years aging is not out of the question. 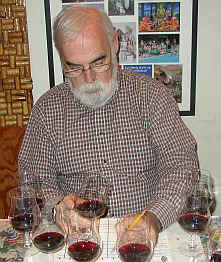 6th Place: PAUL HOBBS 2000 Napa CABERNET SAUVIGNON "Stagecoach Vineyard"
"This wine shows intensely powerful, back-slapping, bacon toast notes and blackcurrants and black olives." said one taster. Another found this to be "sporting a long finish and the most consistent wine of the tasting." A detractor found "asparagus and socks." A fourth person detected "pickle barrel notes with sour oak and a sour finish." Another taster felt it was "too light and too simple." Someone else found it to be "high in alcohol." A final critic found it "vanillin and smoky, but it seemed washed out and tart." I found some cassis fruit on the nose as it veered off to some herbal, stalky, celery-like aromas. The flavors are reasonably good, being moderately intense and having nice length. I pegged it as needing about 3 to 8 years of bottle aging. One star. 5th Place: CHAPPELLET 2000 Napa CABERNET SAUVIGNON "Pritchard Hill Estate"
This wine really polarized the group, with three tasters ranking it first and three placing it last. One taster felt it had a "funky nose and it did not evolve or blossom in the glass. It has stewed cherry fruit notes and plenty of tannin." Someone else found it to be "closed and one dimensional, with medium-dark fruit and nice, integrated tannins. There is a slightly moldy note here, but it has a nice finish." One person questioned whether or not this was corked or had cellar notes. A fourth critic found it "thin and raspberry-like fruit but an amazingly good finish." A fifth person "didn't find anything." One taster found it to be "firm, intense, with earthy currant fruit and dusty currant and plummy notes on the finish with a floral note." Someone found "molasses-like notes and ripe currant fruit with cassis and a minty finish." I thought this was a stunning example of a rich, Napa Cabernet. Ellen also liked this quite a bit. The aromas are lovely, with ripe fruit and a floral tone. There's nice, sweet oak on the nose as well. The same elements shine on the palate, with great intensity. It's big, deep and rich. I gave it two-and-a-half stars. "This shows full body, lots of glycerin and cassis and currants. It's very balanced and harmonious." said one taster. A second person found "plum and flowers on the nose and it's quite good on the palate with black cherry fruit and cocoa." A third taster found "spice and black pepper, while being the best balanced wine with good acidity and not too much tannin." Someone else said it's "lean and herbal, being shy of rich fruit, but showing a note of cedar, herbs and tea with a vanillin finish." 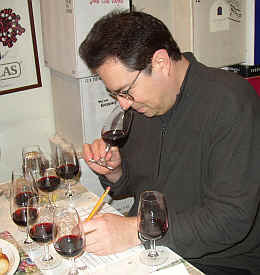 Another panel member found the nose to be "closed," saying it shows "dark currant fruit, toasted oak and mocha with a slightly green aspect to it." I described the fragrance as being reminiscent of candied violets and ripe berries. It's got good fruit and is somewhat floral. Those floral elements are evident on the palate, with good depth and plenty of tannin to go with the deep fruit. Nice balance. One-and-a-half stars+. One taster described this as "big and forward with soft fruit and a bit of black pepper." Another criticized it for being "light," while someone else said "it's one dimensional." One woman felt it displayed "weedy, stinky notes on the nose with a silage component, but there are nice flavors and texture to this wine, even if it is a bit thin." Another person found it to be "big with a complex nose and nicely concentrated berry fruit." A final critic felt it is "rich and well-balanced, with creamy currant notes, a hint of anise, mocha and minerals." I found lots of currants on the nose with sweet fruit and berries. The vanillin oak is quite pretty here. I felt this was one of the most refined and elegant wines in this line-up, being "claret styled" with good cherry fruit on the palate and nice oak. One-and-a-half stars. 2nd Place: JOSEPH PHELPS 2000 Napa "Oakville" CABERNET SAUVIGNON "Backus Vineyard"
"This is bitter with green olives, mushrooms, cherries...all wrapped in some mildly green tannins." said one critic. Another person found "deep cassis fruit with way too much tannin for that level of fruit." A third person felt it had a "lingering finish and it's well-balanced." A fourth critic said "it's almost chewy and thick." 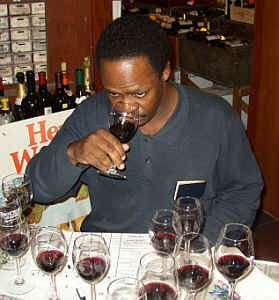 Someone added "It's concentrated and balanced, showing the greatest potential of any wine in this tasting." Other adjectives included "coconut milk," "sweet oak," "chocolate" and "caramel." I found lots of incredible black raspberry fruit with sweet notes, vanilla cream and great intensity. Yes, it is a tannic, structured wine with lots of dark fruit and berry flavors. There's a wonderfully cedary quality to this. I awarded it a two-star+ rating. 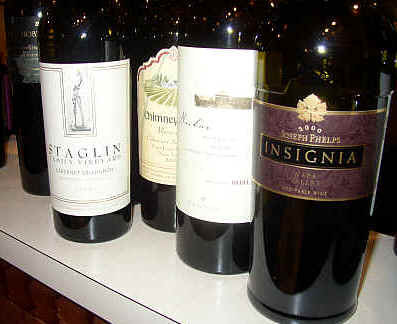 1st Place: JOSEPH PHELPS 2000 Napa Valley "Insignia"
One taster described this as being "big, rich and extracted with plush currant fruit, sage, mocha, cream and some pencil lead notes all in an elegant package." Another taster found "cherry and rhubarb notes." Someone else said it's got "big fruit and good balance." One critic felt it "was closed at first but it really opened to show nice, dark fruit and coffee-like elements." Another panel member felt it had "burnt cherry cobbler notes, star anise and a spicy lavender character with some black licorice. It's tannic, but not bitter." I enjoyed the aromas, finding it to have really nice Cabernet fruit and dark plum notes, blackberries and sweet wood on the nose. There's a fair amount of oak on the palate, but the wine balanced the wood with deep, dark fruit flavors. Two stars+.